Fun little running game. It’s set in an Indiana Jones sort of jungle. 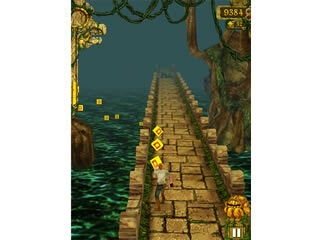 You’re running away from monkeys and have to jump and slide to miss obstacles and turn left or right by sliding your finger on the screen to stay on track. You can upgrade coin value and buy a coin magnet, which makes the run more profitable. 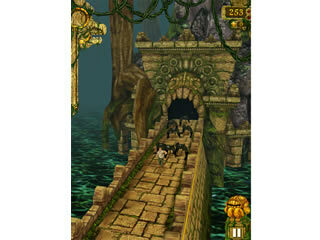 In Temple Run, you can tilt your phone left or right to get the runner to move to the left or right side of the track. Here’s a hint: if you slide your finger a bit early for a turn, the guy will wait and turn at the right time. There are coins to collect, and a store where you can buy upgrades with the coins. New characters, powerups, wallpapers and utilities are available. The track is a bridge that’s suspended over some water. It gets pretty thin in some spots, so collecting coins can be a challenge. You can upgrade coin value and buy a coin magnet, which makes the run more profitable. The graphics aren’t too impressive, to be honest. It’s set in one of those weird jungle lake Great Wall of China bridge with burning clotheslines occasionally mossy without being any more slippery than the cobblestoney area with tree stumps you can trip over twice before the monkeys get you with an occasional mystical blue bridge kind of settings. It seems there is an idol at the end? Really, you need to turn your brain off before turning the game on, but it’s kind of fun to jump and slide around like that. If runner games are your passion you will be so pleased, but if you are looking for a more bright, colorful, and cheerful game, you might try Despicable Me or something like that.